Would you take the trip? The average temperature on Mars is 81 degrees below zero. But scientists say that in 12 years, we may be able to visit, even live there. Pictured here, four who’d love a ticket: astronauts Nicole Aunapu Mann, Anne McClain, Jessica Meir, and Christina Hammock Koch, photographed at NASA’s Johnson Space Center in Houston. In first grade Jessica Meir made a drawing of herself standing on the moon. Turns out she underestimated her own ambition: Today, at 41, Meir could become the first human to touch down on an even farther destination: Mars. A next step for man? Yes, and a giant leap for womankind. The mission itself is at least 12 years away—it will take that long to build and test every last piece of equipment. But it’s already the most hotly anticipated space-exploration effort ever. Governments around the world—in China, Europe, and Russia—have plans in the works to at least land robots on Mars, while in the U.S., private companies like SpaceX are partnering with NASA on a human mission and plotting their own commercial trips. And unlike the 1960s race to the moon, this time women are playing pivotal roles—building rockets, designing space suits, and controlling the remote rovers that are already sending momentous insights back from Mars. Also phenomenal? For the first time NASA’s latest class of astronauts is 50 percent female. A fearless group, Meir and her colleagues Anne McClain, 39, Christina Hammock Koch, 40, and Nicole Aunapu Mann, 41, have already flown combat missions in Iraq, braved the South Pole, and dived under thick layers of ice in Antarctica. Last fall they gave Glamour exclusive access to watch them train at NASA’s facilities in Houston—and talked about their epic adventure. NASA inducts a new class of prospective astronauts every four or five years, and competition is fierce. From application to acceptance, the process takes a year and a half and includes intensive psychological and medical testing. When these women were chosen for the class of 2013, NASA announced that they could be selected for an inaugural trip to Mars. Anne McClain: There were more than 6,100 other applicants for our class of eight, and I’d made my peace with not getting in. I still remember getting the call that I’d been selected. I couldn’t breathe, I couldn’t talk. I started crying. I grew up in Spokane, Washington, and I can’t recall ever not wanting to be an astronaut. I learned a lot [serving 15 months] in Iraq, flying attack helicopters at the front of the front lines. I joined the Army out of a deep sense of duty, but wanting to be an astronaut feels more like my destiny. With so much conflict in the world, space exploration can be a beacon of hope. No one cares about race or religion or nationality in space travel. We’re all just part of Team Human. Jessica Meir, Ph.D.: I had a fantastic view of the stars from the teeny town in Maine where I grew up. Maybe that’s why I wanted to be an astronaut from such a young age. I’ve always been drawn to remote places—and extreme challenges. While doing research on emperor penguins for my Ph.D. in marine biology, I lived and worked in Antarctica, where I also went scuba diving under several feet of ice. Nicole Aunapu Mann: I’m probably one of the few astronauts who didn’tknow that’s what I wanted to do as a kid. “Astronaut” seemed like a far-fetched dream. I’m from Penngrove, California, and it wasn’t until my first tour in Iraq flying fighter jets with the Marine Corps that I realized one day I might actually be a good candidate. Going into space will be the absolute coolest thing in the world. During their two years of training, astronaut candidates learn space skills: flying T-38 supersonic jets that can go 20 miles per minute to practice operating a spacecraft; mastering tasks under 40 feet of water in a massive pool called the Neutral Buoyancy Lab to get used to weightlessness; and surviving what they call the vomit comet. Koch: The most exciting part for me has been the T-38. As an engineer I’m used to going into my office to think through a problem. But in a supersonic jet, you don’t have that luxury! Meir: For me one of the most rewarding things has been spacewalk training. When you put on the suit, you weigh around 400 pounds. Two people help you into it, and a crane lowers you into the pool. The whole six-hour session is incredibly physically challenging. Your arms stand out at awkward angles because you’re inflated; your gloves are bulky and pressurized. Each motion, even just making a fist, requires so much effort. You learn pretty quickly that trying to rush really gets you nowhere. (As they always say, in the suit “slow is fast.”) At one point I saw a classmate in a space suit, and I thought, Oh my God, he’s really an astronaut. And then it hit me: After 30 years of wanting this so badly, I’m an astronaut too. Mann: The vomit comet totally blew my mind. Meir: It’s a large plane that’s hollowed out. When the pilot is at the top of the parabola and free-falls back down toward the ground, you’re weightless for about 25 seconds. You repeat that cycle 30 or 40 times. A lot of people get sick, hence the name. You never forget the first time you’re weightless. I loved it. McClain: We try to prepare [for everything]. Let’s say you get a toothache—will someone on the crew be trained as a dentist? When you get there [after nine months], how sure on your feet will you be? But I have no doubt NASA will find solutions. Walking out to the launch pad, would there be that fear? Absolutely. But if you don’t face your fears, the only thing you’ll ever see is what’s in your comfort zone. 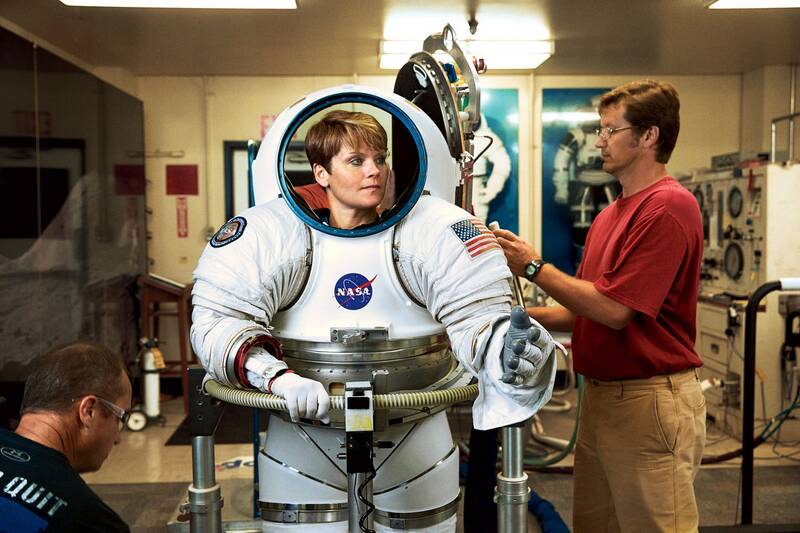 Learning to spacewalk: “Getting into a space suit is like getting into a small aircraft—it’s hard work,” says McClain, here trying on a prototype. For the next 12 years, the astronauts will be honing their skills both on Earth and in outer space—even, likely, flying the Mars mission’s small blastoff capsule to an asteroid near the moon as a test run. Once it begins, the actual mission will go something like this: The four crew members selected (potentially from this class and others) will spend two to three weeks in the launch capsule, then rendezvous with a larger spaceship—a.k.a. “home”—for the rest of the months-long journey. Once on Mars, they’ll live up to a year in a structure that will have already been built by robots before returning to Earth. That’s a long time for four people to be hermetically sealed together. Will they fight? Get romantic? In one series of NASA-funded studies known as HI-SEAS, six men and women spend up to a year in a 1,300-square-foot biodome on the side of a Hawaiian volcano to help answer those questions. Suzanne Bell, Ph.D., a NASA-funded psychologist researching group dynamics on extended missions: A Mars trip has all the ingredients for falling in love, and researchers have seen the danger of that in simulated environments. In one incident a man made unwanted sexual advances toward a woman in the other group, and they decided to shut the hatch between the two groups. It’s something NASA has to think about if they’re going to send men and women to space together for three years. Martha Lenio, Ph.D., 35, a former HI-SEAS volunteer who hopes to become an astronaut for Canada:We did have conflicts, like whose turn it was to vacuum, but nothing we couldn’t work out. In general what I most worried about—like getting bored with the food since everything is freeze-dried or dehydrated—wasn’t a problem at all. We’d compete on how creative we could get with taco and pizza nights. By the end of the eight months, some of my crew mates were really ready to get out, but I could have stayed longer! Sheyna Gifford, M.D., 37, a doctor in St. Louis who is currently living in the HI-SEAS dome for a year: The researchers “back on Earth” (we consider ourselves “simulated astronauts” in “simulated space”) are giving us tools to deal with the isolation. We have some virtual reality [VR] games that our loved ones at home can play too, so we can leave each other notes and photos or have treasure hunts. Another researcher is going to use VR to “send us to the beach” for a few minutes a week. That may prove very transportive! For a mission to Mars, crew members may be able to take only two shoe boxes’ worth of personal belongings. But the hardest thing to leave behind? Family. Three of the astronauts are married, and two are mothers. Koch: I’d definitely miss my husband. When I was at the South Pole, I packed boxes of things to take with me and opened one every few months, so I had something to look forward to. For Mars I’d ask my family and friends to make small surprises for me to open on designated dates. A handwritten card when you’ve been away 15 months can be the best thing imaginable. McClain: [For a long-term mission today,] I’d want a way to video chat with my three-year-old son and my partner. Leaving them is the only downside to space travel; they are my everything. I’d also bring my son’s stuffed monkey. He would dig seeing it floating in space. Meir: I’d need music—the Red Hot Chili Peppers. I would definitely request mixes from a few specific friends, and I’d try to get access to The New York Times. Mann: If I get tapped for the mission, I’ll talk to my son about what I’ll be doing. He’s almost four now but will be a teen or in his twenties by then. His life will change while I’m gone. And that’s a big sacrifice. If chosen for the expedition, these women and their fellow astronauts will make many big sacrifices. But they will also go on what could be humankind’s greatest exploration to date—an experience those who came before them can only begin to imagine. Richard Garriott de Cayeux, 54, a private astronaut who has traveled to the international space station:When you’re floating in a slightly stale-smelling, noisy tin can, you have this experience astronauts call the overview effect: From space you can see how weather forms and moves, you can see Earth’s tectonic plates’ seams and deserts and oceans. And suddenly this place you’ve always thought of as vast looks small and fragile. It’s impossible not to feel an urge to protect our environment and our planet. Tracy Caldwell Dyson, Ph.D., 46, an astronaut who lived at the space station for almost six months: Every night I’d spend 90 minutes watching as we orbited Earth. You’re passing it at 17,500 miles per hour, so you have only a moment to soak in the view before you’re looking at something else. The most intense experience? My first spacewalk to repair a cooling pump that had failed. I understood how enormous and potentially dangerous it was to be stepping out into the vacuum of space [in nothing but a space suit]. I’m thrilled for the women who are coming after me. I can’t wait to see where they go and what they do. McClain: If we go to Mars, we’ll be representing our entire species in a place we’ve never been before. To me it’s the highest thing a human being can achieve. Meir: What are people capable of? That idea of exploration has always been a part of the human experience. Trying to understand our place in the universe is what drives me more than anything. McClain: Also, from space, you can’t see borders. What you see is this lonely planet. Here we all are on it, so angry at one another. I wish more people could step back and see how small Earth is and how reliant we are on one another. Mann: Just thinking about it gives me chills. Did you like the post? Comment down bellow! The engineering mystery: Where are the women?